I have a terrible weakness for candy. Terrible, and we're not talking high end quality chocolate. We're talking the garbage stuff. The kind of stuff that could only exist in the presence of technology that can make purple or red chewy things that look not of this earth. I mean, I like toffee and normal candy too but what really gets me going is Red Dye number Bazillion. Swedish Fish, Twizzlers the more unnatural the more I dig it usually. So, here's the thing. I am fairly fit and according to my doctor, really, really healthy, and that may be relative to the American average, which ain't so hot. In terms of meals, I eat incredibly healthy, which I largely owe to my wife. You will not find much in the way of canned food in our pantry, maybe some tomato paste with about 4 ingredients listed. I look at labels, and most of what I eat doesn't come wrapped in cardboard or plastic. I feel pretty good about this, or I did. I know there are folks out there who are going whole hog, or probably not, eating vegan, gluten-free, paelo etc. I'm not interested in that. I like indulging from time to time, I enjoy meat and frankly I enjoy the candy. I also love kale, brussel sprouts, beets etc. Balanced. Through my cyclocross racing I became involved with Bob's Red Mill, one of the greatest American food companies out there. Don't get me wrong, I'm not sponsored by them as a Cat 3 Master's racer, that's a crazy idea, but I get to demo products from them from time to time and they send me really cool things. They sent me a book. Salt, Sugar, Fat; How the Food Giants Cooked Us. This book has really rattled me and my happy candy haze. It's a great book and frankly it'll make you angry but it's worth a read. It largely deal with food engineering, and the early parts of the book were particularly telling for me, they deal with sugar and how sugar has been used to develop food addiction and the various diseases that develop given our large intake of sugar. The book has led me to cut out putting sugar in my coffee entirely and I went on a 6 month no candy, doughnut, fun hiatus. I lost 4 pounds, and frankly I didn't do it to lose any weight, I'm a skinny guy. But that gives you a sense of how bad sugar is for us, the empty calories, the binge eating. It's not natural and it's something we oughta think twice about. In an effort to be more uplifting this week's Friday Find is all natural. The wines being made at Cooper Mountain Vineyards take very seriously the kinds of things that both go into the wines, and the soils of their vineyards. Biodynamics and organics are the rule of the day there. You can read a piece I wrote on them in the early days of the Anthem here. 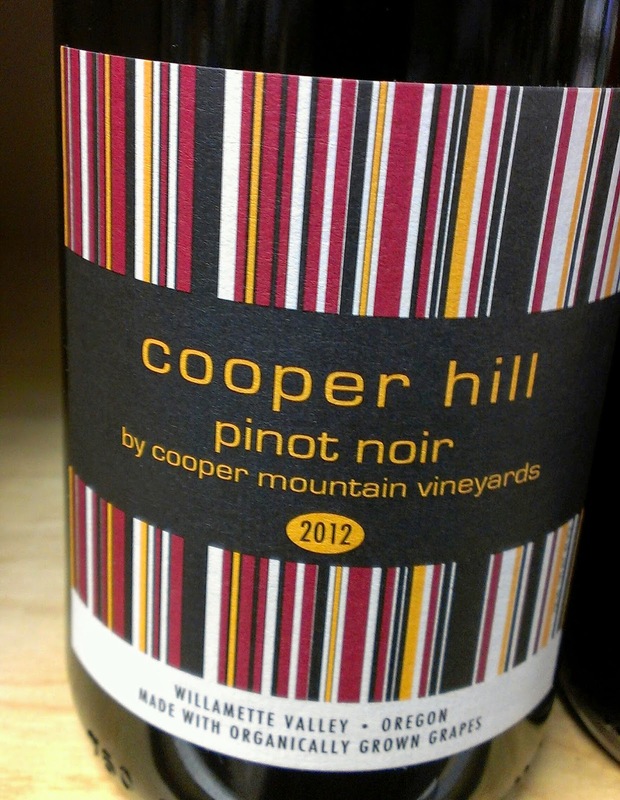 Today's wine is from their "second label" the Cooper Hill 2012 Pinot Noir. It's a bargain and typically of what you often see from Cooper Mountain doesn't skip on minerality and earthen character. You don't often get that in a $16-20 Pinot Noir. There's plenty of red fruit, a mouthfeel that hints at a higher price-point and ample approachability (which according to spellcheck is not an actual word) to this wine as well, modest alcohol levels make for a bright, fresh Oregon Pinot Noir on a budget.